Say ‘ahoy’ to your free Original Glazed doughnut! Krispy Kreme Doughnuts today announced that participating shops in the United States and Canada will celebrate Talk Like a Pirate Day on Sept. 19. Any swashbuckling guest who talks like a pirate will receive one free Original Glazed doughnut, while fans who dress like a pirate will receive one dozen Original Glazed doughnuts. For the first time this year, guests can also use a custom Krispy Kreme Snapchat pirate filter to digitally ‘dress’ like a pirate. Any guest who shows their Snapchat image at a participating shop will qualify for a dozen Original Glazed doughnuts. Show your snap to a team member inside the shop and score ye bounty. Arrrr…. Two Pirate Doughnuts are also available ahead of Talk Like a Pirate Day. The Pirate Doughnut is a filled doughnut decorated with a pirate face, while the Skull and Crossbones Doughnut is topped with chocolate icing and finished with white icing and a skull candy piece. Qualifying pirate costumes must include three pirate items, such as an eye patch or bandana. No purchase is necessary to take part in Talk Like a Pirate Day. Ahoy There Mateys! 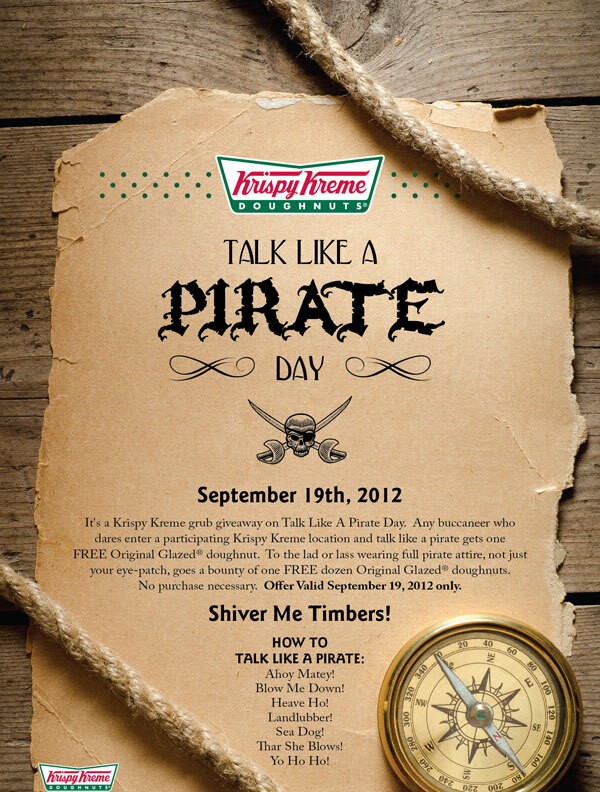 Thursday, September 19, any buccaneer to enter a participating Krispy Kreme and talk like a pirate gets one FREE Original Glazed® doughnut. To the landlubber who dares to wear full pirate attire goes a bounty of one FREE dozen Original Glazed doughnuts. Offer good on International Talk Like a Pirate Day, September 19th, only. How to talk like a pirate: Blow Me Down! Heave Ho! Landlubber! Sea Dog! Thar She Blows! Yo Ho Ho! Any buccaneer who dares enter a participating Krispy Kreme location and talk like a pirate gets one FREE Original Glazed doughnut. To the lad or lass wearing full pirate attire, not just your eye-patch, goes a bounty of one FREE dozen Original Glazed doughnuts. No purchase necessary.